These cucumbers are likely the result of poor pollination. It’s a very common problem with cucumbers. 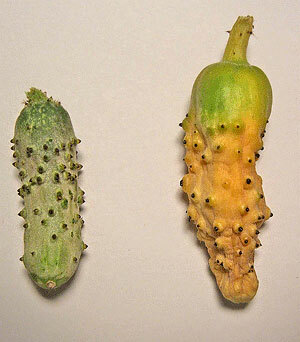 Small cucumbers will form on the female blossom but without being sufficiently pollinated they will not develop and die. Bees are the major pollinators of cucumbers. Unfortunately neither the nectar nor pollen of cucumber (cucurbit family) flowers is as attractive to bees as some other flowers because of the low sugar content. Therefore you might want to try to hand pollinate them by cutting off the male flower and rubbing it on the female (the one with the bulge just below the flower) or, using a small paint brush use the pollen from several male flowers to ensure it is viable. Do everything you can to promote pollinators in your garden by limiting your use of pesticides. If you must use insecticides, use them as late in the evening as practical and never in the morning to avoid spraying bees when they are most active. Poorly shaped cucumbers can also be the result of poor soil conditions and either too much or too little fertilizer. Cucumbers prefer a soil that is slightly acidic with a pH of 5.8 to 6.5. If growing them in containers make sure you are using a high quality potting mix. Irregular irrigation can also result in misshapen cucumbers.Proper pollination is key to growing cucumbers. I got in on the last part of the show today, in Eugene, Oregon on station 310. And would like to know how you bent the frames for the cold frame, or you said that you had the frame to make the bends. Could you tell me more about that, thank Joe. Been witching for about two years now.